Good morning, dear reader. 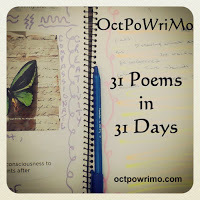 When I received the prompt for our October 24 poem, I was as un-inspired as I'd been in a while. I really had no idea where to go with it, and seriously considered avoiding it completely and posting an un-related piece. But, in the words of a new acquaintance and fellow poet, inspiration is fickle but is rarely unfaithful. The prompt we were given was based on 4 different reality TV shows. I freely admit that I don't watch any of them. So, rather than being inspired by the actual shows themselves (the letter of the prompt), I created my poem from the premise of the shows (the spirit of the prompt). Our prompt TV shows are 'So You Think You Can Dance', 'Project Runway', 'FaceOff', and 'Ink Master'. I have never heard of 2 out of the 4. Our prompt words are 'Make-up', 'Tattoo', 'Dance', and 'Fashion'. In the end, I was inspired. I hope you enjoy this poem. This is a fantastic response to the prompt! Thank you for sharing your poetic reality! Thank you so much, Jessica! As always, it is much appreciated! This reality show is really sensual. Bravo for sticking with it. It was a tough prompt, so I'm glad you like it! I love how you included all art forms from the prompt into your poem. I especially like the very last stanza. I know it to be true for me too. Thanks! I'm glad you saw all I tried to incorporate!! Very nice. I am glad you found inspiration.